Ocean View, Playa del Carmen - This 2 bedroom condo for sale is located in the Coco Beach Area, one of Playa del Carmens most upcoming neighborhood. Very residential, but close to 5th Avenue, only a few steps to the Caribbean Ocean and the white sandy beaches. 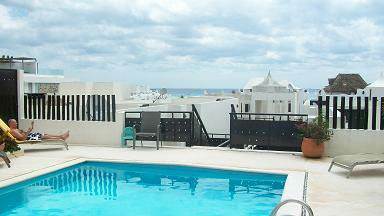 This complex has an amazing roof top pool, a very high demand for vacation rentals and the price of 245k for a 2nd floor unit is very competitive. As the condo comes furnished, you only need to bring down your swim suit with you and can enjoy owning real estate in Playa del Carmen right away.